We WON the Tour of the South, Coed 80/20 Division, of the 100 of Nowhere Bike Race! We were the ONLY ENTRY in the Tour of the South, Coed 80/20 Division, of the 100 of Nowhere Bike Race! 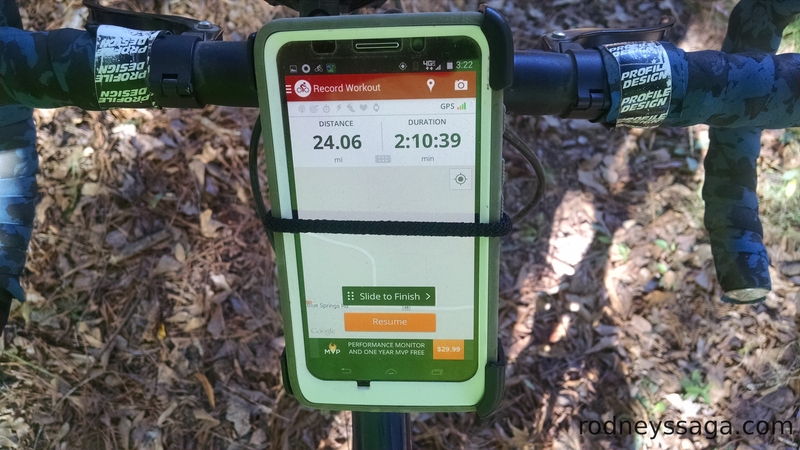 Last Saturday, husband and I split the mileage for a 100 virtual bike race/ride. The mileage was real. 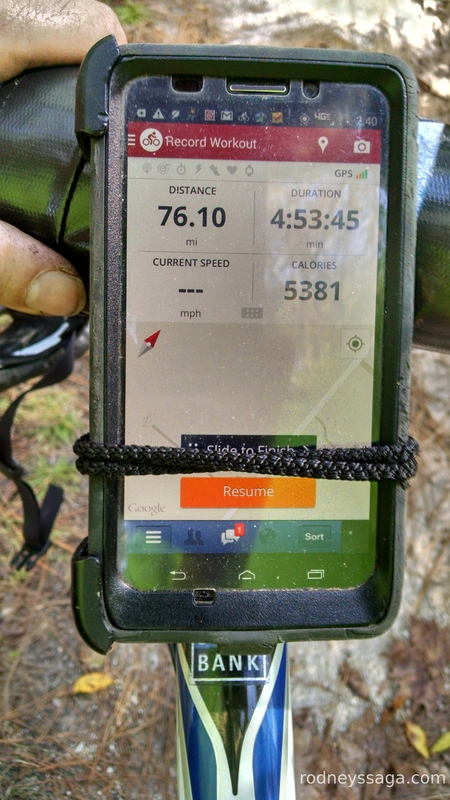 He did 76 miles. I did 24. The virtual part was 500 people doing their thing all over the country (world?) on the honor system. For an explanation of what we did, see my post on the day, 100 Miles to Nowhere. For an explanation of why we did it, I have nothing to offer, other than Why Not? We tag-teamed four times around standard training loops: long one for him, short one for her. I had signed on for 20 miles, but my chosen route was 6 miles instead of 5. At mile 22, my legs announced their displeasure with the extension. I was too busy obsessing over my mileage readout to care. I had the anchor leg, so the trace of my last lap has crenelations. In an effort to squeeze an extra 0.96 mile into the route, I went a bit up this road and came back. I went a bit up that road and came back. I never went far enough for fear of doing even one pedal stroke more than necessary. I arrived at the driveway short of distance. My final mileage was pitiful. I kept going two-tenths of a mile, turning around, going another two-tenths, turning around, and so on, until the magic rollover. Winner of the 2013 100 Miles of Nowhere, Coed Simultaneous Bike and Kayak Relay, Oakland CA Division. “One of the interesting things about spending all day in a park is seeing the ebb and flow of various parts of the community.” Clearly, we weren’t the first ones to think of splitting the miles. 2013 100 Miles of Nowhere: Winner of 144 Laps Around a Park in Houston Category. How on earth did he keep track of so many identical laps? I lose count doing 10 laps in the pool. A laundry miscalculation meant all my bike shorts were damp. From the bottom of a drawer, I dug out an unused biking onesie, because who doesn’t want to test new equipment on the a day of a major ride? The relevant section of the shorts was comfy enough that I will try bib shorts/onesies again. My only complaint is the Pavlovian reaction of having to pee as soon as I did up the zipper. Is it just me or does this happen to other folks? 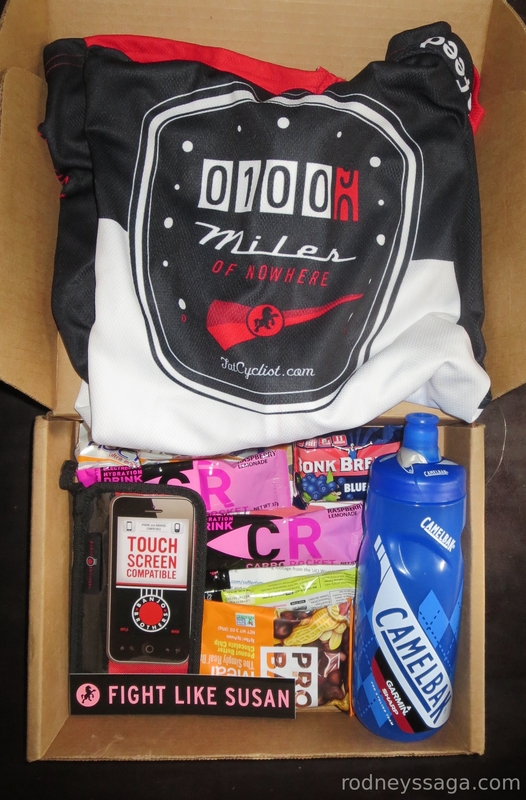 In the spirit of experimentation, I tried the various goodies that came with our race swag. The bar was a lump of sawdust and sat in my belly thusly. On the other hand, I also ate a Glucerna snack bar, which I eat on a regular basis. That didn’t go down any better. I tried the Gu energy gel. It was awful. Vile in taste. Vile in mouth feel. However, I was a picky eater as a kid. Much of my childhood was spent eating things I would rather not have eaten. So I soldiered on. I’ll finish this one and never, ever have to suffer another one again. Hmm. I don’t feel so bad. Perky without the sugar stress. Hmmmmm. I will definitely try the gel again, perhaps even for horse shows. Although I don’t imagine it will taste any better. I will buy the Gu brand, so Good on Them for supporting 100 Miles of Nowhere. Mostly we ate Mint Milano cookies, lemon-lime Gatorade, & Triscuits of the sundried tomato & olive oil variety. The usual suspects. After a week of two-a-day riding lessons, I was looking forward to the biking as a break. A day of mindless pedaling. No excessive emotional investment. No fitting the day’s events into a theoretical framework. No looming national competition to alternately fill me with joy and with dread. All I had to do was poke along slowly on a flat road in the pretty sunshine. Easy-peasey. Plus, the screaming monkeys in my head cut me slack. No one could be expected to do a full slate of daily activities. You did 24 miles? Awesome! You did 24 and three loads of laundry? You rockstar! We are already planning a grander – read sillier – version for next year. 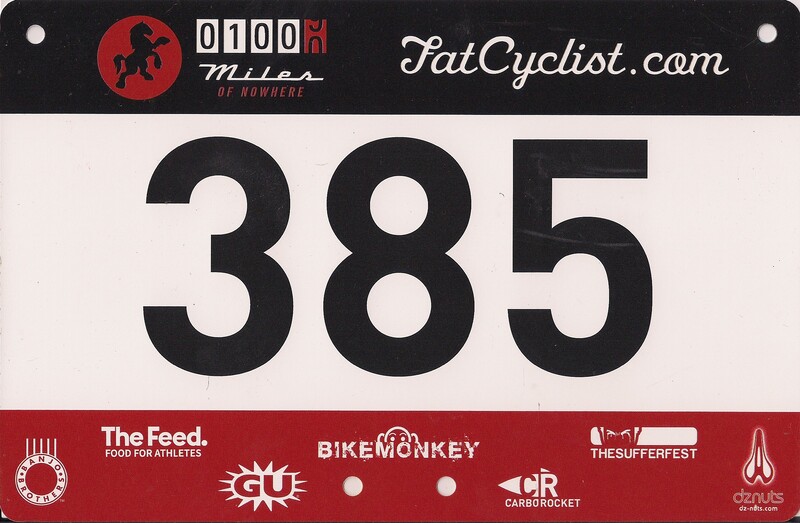 Thanks to the Fat Cyclist for setting up the event! Congrats! Do you get a prize? For signing up, we get the shirt & box of goodies. For winning, we get the joy of lording it over the other competitors in the division.